May 6 through May 12, 2018 is Hurricane Preparedness Week. Sponsored by the National Weather Service (NWS) located along with the National Hurricane Center at Florida International University in Miami, Florida, the event occurs every year about this time to caution residents in hurricane vulnerable regions of the United States to prepare for upcoming hurricanes. 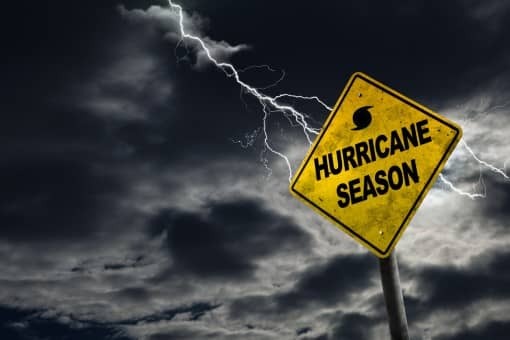 During the week, the NWS urges residents of areas of the United States that are vulnerable to hurricanes to review their insurance policies, prepare an emergency kit, trim shrubs and trees and identify a safe place to take shelter should a hurricane strike. On May 6, people will be encouraged to know their hurricane risk. Residents of hurricane vulnerable regions will be urged to check with local officials to understand their risk, search the Internet for information on their local emergency management agency, and to sign up for local alerts or download the Federal Emergency Administration’s app. On May 7, residents of hurricane vulnerable locations will be encouraged to “Know Your Evacuation Zone.” This includes learning your evacuation route and alternate places to stay during the emergency, how to include pets in an evacuation plan, and practicing your plan. On May 8, hurricane vulnerable residents will learn about assembling disaster supplies. It is suggested that you collect enough supplies for at least 10 days, don’t forget about personal needs including medications, powered devices and pets and keep cash in an emergency kit. On May 9, the theme will be preparing financially. It is urged that you start to create an emergency savings account to cover expenses during a hurricane disaster, check your insurance policy to make sure you have enough coverage, and learn about flood insurance. On May 10, the emphasis will be on “Strengthening Your Home.” It is urged that you make sure your home is in good repair and meets local hurricane building codes, clean out drains and gutters, trim trees, secure loose outdoor items and secure doors, and learn of a safe location where you can move your car in case of a hurricane. On May 11, the event will emphasize that you “Help Your Neighbors.” People are encouraged to get to know their neighbors before an emergency occurs, make certain that they have a plan before and after a hurricane, and exchange contact information with them. On May 12, the focus will be on “Making an Emergency Plan.” Those vulnerable to a hurricane are encouraged to make and write down a plan and share it. The plan should include how you will get in touch with others before, during, and after a hurricane. It is also suggested that you take photographs of important documents and store them in a secure location. It is essential that you have a plan before a hurricane strikes so that you know exactly what to do when it does occur. First, determine what your hurricane risks are. For example, if you live on the coast or on an island then you are vulnerable to extreme winds and flooding from rain and storm surge, thunderstorms, and power outages. To learn more visit https://www.ready.gov/hurricanes. It is also encouraged that you sign up for text alerts and warnings. Know your community’s hurricane evacuation plan and identify several evacuation routes you can use. Keep your car’s gas tank at least half full in case you will have to evacuate quickly. When you are ordered to evacuate, do it. If you rely on public transportation, contact your local emergency management agency about evacuation procedures before the hurricane strikes. Gather your supplies for your hurricane preparedness kit before a hurricane. You can purchase the hurricane essentials over time as extra items during your regular grocery run. Include in your emergency kit games and toys for the children, a hand-cranked or battery-powered radio, extra batteries and extra cash. Store your supplies at home and at your office or place of business in case you have to stay in place during a hurricane and also keep supplies in your car. For more information about creating an emergency kit visit https://www.ready.gov/build-a-kit. Before the hurricane season, continuously trim trees and shrubs, retrofit your roof, windows, and doors and install storm shutters. When a hurricane is predicted to hit, bring outdoor furniture and any other loose items indoors. Finally, be certain that your plan includes a way to communicate with each individual member of your family and designate a person who lives out of town to call to keep contact open should events disrupt your communication plan. In addition, include your pet in your emergency plan. FEMA has a pet owner’s planning guide that you can download. Get it at http://www.fema.gov/media-library/assets/documents/90356. Prepare for a storm so that you are not caught by surprise.